I've been using Banterin from Japan since we went back to Japan last summer. Whenever I feel another migraine attack is going to come, I apply a bit of this medicine to my neck and give it a gentle massage. It works very well. Quite often, I can avoid taking tablets. 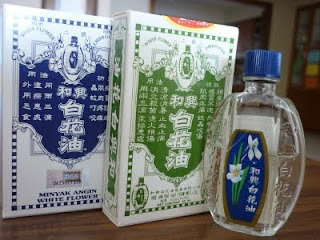 Akiyo bought back a small bottle of "White flower oil" from Hong Kong as she was told it's good for headaches. This works very well! And of course cheaper than the Japanese medicine. I wanted to have another bottle but I thought only way is to fly to Hong Kong. Well, according to the net, it's originally from Singapore and Penang! Then I found a drug store who is selling it. The green box is from Hong Kong, the blue one is from Penang.